Tangle Teezer Review - Oh So Girly! I don’t know if every girl experiences this, but for some time now I’ve noticed that when you have long hair and wear it down, you sometimes get a fine cloud of short squiggly hairs sticking up at all angles around your head (“whispies” / “halo”) – hairs that have probably been torn and broken from brushing. Personally, I like my hair healthy, smooth and squiggle-free and also there’s the point that the more hairs that break around the top of your head, the thinner your hair will be lower down if you want to grow it long. Thanks to AnitaPeppers on Morguefile for use of this image. So, a couple weeks ago I was looking online to find what solutions people had for gentle haircare that doesn’t result in hair breakage. There was a lot of good advice like avoiding harsh hair-treatments (dying, heat-treatments), and not wearing hair ties often, and if you do making sure your hair ties are padded and soft (like scrunchies) so that they don’t put too much pressure on the hair. A lot of websites talked about using wide-toothed combs and gently working them through your hair rather than roughly pulling a brush through it. All these things I’d heard of at some point or another, but there was one bit of advice that was new to me: “Try using a Tangle Teezer”. 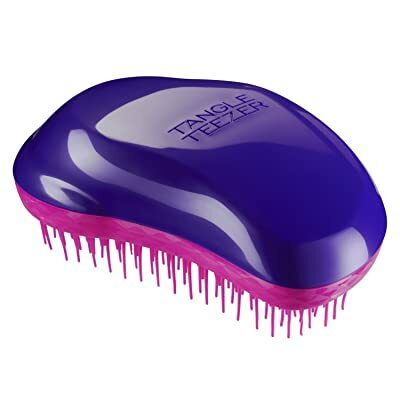 I hadn’t heard of a Tangle Teezer and didn’t know what one was but a quick google search lead me to the very informative Amazon.co.uk page on it which showed me it was a special hairbrush, specially designed by a hairdresser called Shaun Pulfrey who presented this brush on the British enterpreneurial program “Dragon’s Den”. When the brush first arrived, to be honest, I was a bit underwhelmed. My initial impression was that it felt like one of my childhood dolls’ hairbrushes, made of relatively cheap-feeling plastic. The brush’s haphazardly angled teeth are spiky to your fingers-touch and I found it hard to imagine this feeling like a “massage” on your head as some of the Amazon reviews stated. But, I was determined to keep my mind open until I tried it. When you work the Tangle Teezer through dry hair, it does glide very easily through it. If it meets a knot or tangle, it seems to sort of gently glide over it. When I first noticed it doing this, I thought it was just gliding over tangles and not working them out but I noticed that it really did work it more loose as it glided. I found myself not having to go over tangles as many times as I normally would with a comb or a normal brush – definitely a good thing. Calling it “miraculous” as some Amazon reviews do, may be going a bit far, but I was pleasantly surprised as to the brush’s efficiency. When passed on top of the head though, the brush does feel a little bit spikey. One of the claimed benefits of the Tangle Teezer is that it is gentle on wet hair which is when hair is most prone to breakage. I tried the Tangle Teezer after washing my hair and found that it did indeed pass through any knots and tangles with great ease – although to be honest, I always find it quite easy with a normal comb too after using a good conditioner. Was there less hair breakage? To be honest, I’m not sure I can tell yet. There were hairs caught up in the brush after using it (both with dry and wet hair) but that doesn’t necessarily indicate breakage – it may simply be natural shedding. It’s still early days to report on whether there was less hair breakage but I’m looking forward to seeing progress in the coming months of using the Tangle Teezer. Personally, I’m not sure either way if I noticed an increase or decrease in whispies. But the brush is convenient to hold and use – perhaps more so than an ordinary brush. So will I continue using the Tangle Teezer? I think for dry hair, yes, since it does work as good as, if not better than my normal paddle brush. For wet hair though I think I will stick to my comb since it always did a good job and my gut tells me a wide-toothed comb, handled gently, is gentler on the hair than any brush.